Vadim Karpinos was appointed to the Chicago Symphony Orchestra in 2001 by Maestro Daniel Barenboim. He was born in Kiev, Ukraine and began showing an interest in percussion at a very early age. When he was five years old, he started playing the drums with a children’s music group, and was accepted at the Revutsky Music School to study with Igor Sheremet. At Revutsky, he won numerous awards, including the Prize Winning Medal in 1987, an award from the Kiev Children’s Philharmonic in 1989 and first prize in the former Soviet Union’s Young Virtuoso competition. After he and his family moved to New York in 1991, Vadim began studying with David Fein through Julliard’s pre-college program. In 1992, he entered LaGuardia High School of Music and Art, where he received several awards including the Louis Smadbeck Scholarship, the Dr. Randolph Goodman award and the Morton Gould Memorial Award, in addition to winning several concerto competitions. He was also the first place winner of the ASCAP Leiber and Stoeler Scholarship. Vadim attended the Manhattan School of Music student and studied with Christopher Lamb, Duncan Patton and Don Liuzzi. He was also a Tanglewood fellow and performed with numerous orchestras, including the New Jersey Symphony, the New York City Opera and the Rhode Island Philharmonic. He has appeared as a soloist with the Chicago Symphony and at Roosevelt University, where he has been an adjunct faculty member since 2005. He is also on the board of advisors to The New Music School in Chicago, and he gives percussion clinics nationwide. 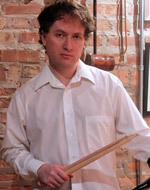 Vadim endorses Zildjian and Innovative Percussion. In his spare time, he enjoys playing basketball and soccer, traveling and spending time with his wife, Danielle, and his baby daughter, Anya Nessa.